Should kids always read great literature? I don't believe so. There are many roads to becoming a lifelong lover of reading. Allowing kids to choose their own route and their own books makes good sense. But I hope all kids get the chance to read good literature, because it truly does feed their hearts, minds and souls. The Berenstain Bear books might not be classed as great children's literature. But their colourful illustrations, zany antics, humour and readability have made them hugely popular. They can be found in classrooms, libraries and garage sales in many English-speaking countries. The books I remember include The Big Honey Hunt, The Bike Lesson and The Bears' Picnic - in other words, we're back in the 60s, folks! There are recent titles too as you can see in this list. Check out some hot tracks on Brother Bear's BearPod. Try the Maze to Bigpaw's Lair - just make sure you don't wake him up! Sister's got a secret message for you - can you solve it? Take a tour of the Bears' Tree House from the cellar all the way up to Brother and Sister's room. Visit the library or take in a movie. Send an e-mail to Mama, Papa, Sister or Brother (or the whole family). 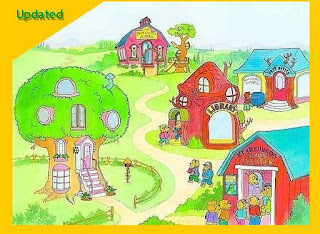 The Berenstain Bear website might be just the encouragement your kids need to look for the books in their local library or at school. Lots of adults who love reading today learnt to read on Berenstain Bear books. Do you have a favourite? ***Co-creator of the Berenstain Bear books, Jan Berenstain, passed away last month. Her family honoured her memory by directing memorial gifts to Reading is Fundamental – USA’s largest children’s literacy nonprofit. What a legacy she leaves behind! Thank you to the Berenstain for their contribution to my childhood. I also couldn't agree more with the Book Chook. First and foremost, kids need to read for enjoyment. Fingers crossed that will lead on to reading great literature. Kids are very discerning - for them to read the great literature it has to be a great read as well. @Vicki StantonThat's a good point, Vicki. It's true for me too. I have tried some multi-awarded literary fiction and not been able to get past the first few pages. The writing itself was beautiful but the character and plot left me disengaged. However, I must admit to getting really excited if I find someone, adult or child, who shares my enthusiasm for a book, any book! We are huge fans of The Berenstain Bears in our household, but I had no idea it had a website. I cannot wait to explore it with my kids! Thank you!